The work of recording the archaeology of the site as work proceeded on the excavation of the burial pits. Their backfilling with animal carcasses could, at times, be very unpleasant. Nonetheless, the archaeological contribution did provide a positive aspect to a very unhappy situation. The sites of a previously unknown Bronze Age barrow cemetery and Roman farmstead were discovered, as well as part of the medieval open field system. The strategy was to undertake a watching brief on the initial soil stripping and excavation of the burial pits themselves. Initial finds suggested the presence of a Roman farmstead, whose corner had been clipped by the excavation of the burial pits. A geophysical survey was then used to target potential areas of high potential (based on initial results). As a result, the rest of the plan of the Roman farmstead was recovered, suggesting that the bulk of this lies preserved beneath the runway and land to the north. A completely unexpected find from the geophysical survey was a Bronze Age barrow cemetery, dating back c.4,000 years. This was in an area which was originally going to be used for the excavation of burial pits. Because of the significance of the discovery, however, MAFF immediately took this part of the site out of the scheme. The cemetery has, therefore, been preserved. 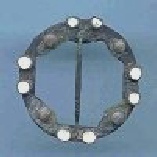 A roman broach found during excavations. In march 2002 Time team did a project on the Throckmorton airfield.